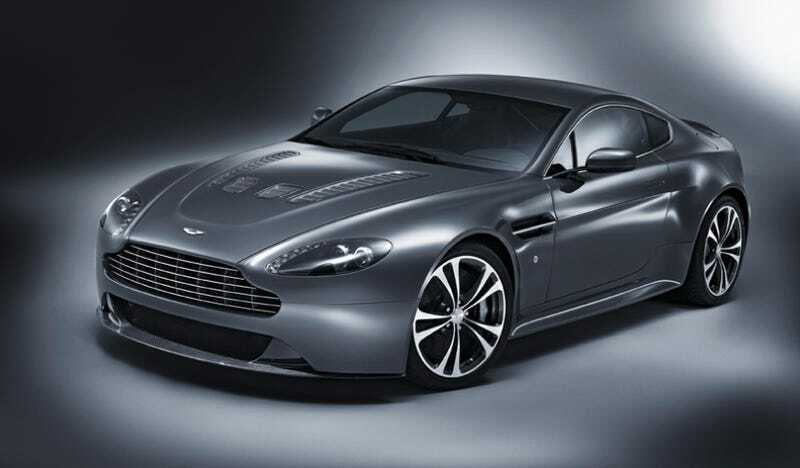 Here it is, the Aston Martin V12 Vantage, and it's coming to Geneva to bring the Vantage RS Concept to life. Thanks to the good folks at Drivers-Republic, we've got an exclusive first-hand look below. While not overly different-looking from the V8 Vantage, this high-powered 6-liter V12-engined monster gets all new front and rear bumpers, front splitter, sills, rear diffuser, hood and trunklid to differentiate itself from its lower-powered sibling. The splitter and hood vents are carbon fiber to aid in minor decreases to weight. Apart from a bespoke throttle map it’s standard DBS, which means 510bhp at 6500rpm and 420lb ft of torque at 5750rpm. No, that isn’t a match for the RS Concept’s feral 600bhp, but lest we forget that car was powered by one of Aston Martin Racing’s DBRS9 motors, which had a dry sump (rather inconveniently located in the boot), no catalytic converters and a rather relaxed attitude to emissions. It also needed an engineer with a laptop to fire the thing up, and had a hair-trigger throttle. In short it was never going to make production.